Home / FPS / Guide / Online Games / Paladins / PC Games / Realm Royale / Strategy Advice / Tips / Tricks / Realm Royale guide - Now updated with loads more advice for all areas of the game! Realm Royale guide - Now updated with loads more advice for all areas of the game! Our Realm Royale guide contains class abilities, crafting help with shards and the Forge, and loads of tips, tricks and strategy advice. Realm Royale is now in Alpha and this is the Paladins twist on the Battle Royale formula that formerly went by the name of Battlegrounds. 100 players (of course) leap from the sky onto the map below, then do battle with one another until the last player's left standing. Those of you who have played Fortnite or PUBG will know what to expect here, but this is very much a fantasy-infused fight to the death. 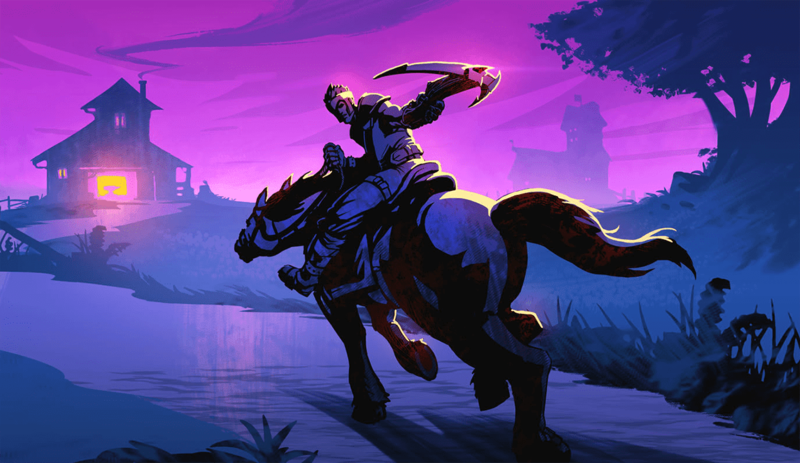 In our Realm Royale guide we've got a breakdown of all the basics you need to know in order to get stuck into the game. We'll be breaking off into more detailed guides on each of the categories in this article over time, so check back regularly and do explore the site - whatever you're stuck on, we'll have the answer for you before long! We've added quite a lot of new guides articles the site over the last few hours. We've added each one to the relevant section of this hub, but you can also use the links below to jump straight into the latest stuff. Best Class Tier List - It's important that you pick a class that suits your playstyle, but there are certainly some that are proving more powerful than others in a relative sense right now. Map Guide - All of the zones and subzones that are currently available in Realm Royale, with Forge locations and tips on loot spots to be added to each zone as we become more familiar with them. Warrior Guide - The first of our class guides is now live on the site and will show you the ins and outs of making the best of the Warrior's ability suite. More tips and tricks will be added to this as we continue mastering the class. Finding and Spending Shards - This article explains how to get your hands on more Shards (without annoying your teammates) and spend them in the Forge to obtain more powerful equipment. Use the following links to quickly navigate to the section of the guide you're most interested in right now! Assassins - Focused on stealth and catching their opponents by surprise. Engineers - Capable of building shields and turrets. Hunters - Agile characters who possess stealth and the ability to lay mines. Mages - Spell-chucking glass cannons with big damage. Warriors - Strong melee characters who can take a good beating on the battlefield. Each class in Realm Royale also has its own passive ability. This extra power is applied automatically, and requires no effort on the part of the player to make use of - hence the name! Having picked an archetype that suits your tastes, your next challenge is to actually load up on weapons and abilities. Yep, you've read that right. In order to make any kind of real difference in battle, you're going to need to find the abilities that define your class. These are collected from around the map just like physical equipment, but the good news is that you don't have to worry about opening up a Hunter ability as an Assassin or vice-versa. Whatever class opens a chest determines the kind of ability that's found inside it. If you've played games like World of Warcraft then you'll be familiar with the concept of being able to “disenchant” items in order to gain crafting materials. In the case of Realm Royale, the concept of the Shard is introduced. If you've got a piece of gear that isn't a tangible upgrade, you can disenchant it and use the Shards produced at a crafting spot called the Forge (see the next section for more detail). Given that there is absolutely no advantage to leaving stuff lying around on the battlefield for enemy players to scoop up, we recommend you disenchant everything you lay your hands upon and really don't need. Just make sure your teammates can't make better use of it first though, eh? Note that you get more Shards for disenchanting more valuable gear. Expect to get a handful of Shards for disenchanting a Common item, for example, but a much fatter stack for anything rare than that. Want to get your hands on more Shards? Our dedicated page on how to get more Shards and spend them at the Forge is live on gameplayguides.net right now! As mentioned above, Realm Royale also features a crafting system known as the Forge. When you use these special world items, you'll be able to trade in your Shards in order to make new equipment. As an example, you can craft potions to boost your health and armour for the price of 30 Shards. Having potions to chug as you fight across the map is handy, of course, but what you'll really want to do at the Forge is cook up new Legendary items. If you can trade in 60 Shards you'll get a random piece of Legendary armour from the Forge, while 90 Shards will secure you a random Legendary class ability. 120 Shards is good for a random Legendary weapon. There's a catch to all of this crafting opportunity though - and beyond have to gather those Shards in the first place. It takes a little bit of time to actually craft each item, which means you need to be keenly aware of the environmental dangers all around you. That might be the encroaching fog, for example, or a pack of players preparing to tear you to shreds. The good news is that you can at least craft multiple items at once, so load-out and get forging. As if this commitment to crafting wasn't unfortunate enough, the Forge makes a bit of a racket when it's in full steam, and it will also send up chimney smoke. This makes it abundantly clear to the outside world that someone is both in there and potentially cooking something tasty up. Keep in mind as well that the item you make isn't simply added to your inventory, it drops to the floor. That means it can be pinched by other players who come in! As with other Battle Royale games, the gear that you collect during gameplay belongs to a specific kind of rarity: Common, Rare, Epic and Legendary. The better the rarity rating, the more powerful the version of each item will be. Note that Epic and Legendary item provides additional bonuses as well. Your Groundspeed rating might increase, for example, or you'll be able to reload your weapons much more quickly. If all of your potions, abilities and crafted gear haven't been enough to keep you alive, then you'll be transformed into a chicken once you hit 0 HP. The good news is that this grants you the chance to get back into the game once again, but only if you can survive long enough. If you can - in chicken form - survive just 30 seconds of flailing around without the use of any of your abilities, then you'll be transformed back into your previous form and with all of your abilities restored. Now that you've got a decent grounding in the game, let's look at some tips and tricks that the community have been picking up on since the game went into Alpha a little earlier on today. Expect this section of our Realm Royale guide to be expanded on significantly over time. Parachuting into battle works a little differently here than in other Battle Royale games. For a start, there is no parachute! All you have to do is pick your spot from the starting blimp, head towards where you want to go and you'll get there pretty quickly. Once on the ground it's time to start scavenging. Look for chests first as these contain weapons, armour and abilities. Loot boxes secondly, as they contain potions, which aren't going to be nearly as effective in your first early firefights. Keep an eye on your map for golden chests that sometimes appear. These contain Legendary items which are the most valuable in the game, but it goes without saying that every other nearby player is going to want a piece of this action as well. Be ready for anything if you try to grab one of these. When gathering Shards to spend on Forge crafting, do keep in mind that you can only carry up to 200 of these currency items at any given time. Once you've exceeded that limit you won't be able to pick up any more, so it's worth at least cooking up a quick potion somewhere so you can start stuffing your pockets once more. Always keep one eye on the position and size of the poisonous fog that encourages player interaction in Realm Royale. Be ready to move and assume an advantageous position for the next constricted round of gameplay. This is especially important when it comes to committing crafting time at the Forge. Head over to our Realm Royale tips, tricks and strategy advice page, where we'll be adding in greater detail as we gain more and more experience with the game.